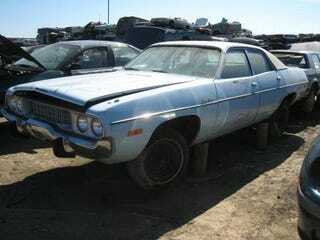 A supporting actor in countless Malaise Era cop movies and TV shows, the 4-door early-70s Plymouth Satellite has just about disappeared from American streets by now... and now the number of street-driven Satellites has been reduced by one. I found this example (painted in the Malaise color I'm going to call Diminished Expectations Blue) in a local self-service junkyard. Can you just imagine this thing with a gumball machine on top, screeching through turns in a frenzy of understeer during pursuit of a sideburn-sportin' perp scumbag in a Chevelle?